Within three months of his hip surgery at Vanderbilt, Tristan Miranda was back on his surfboard. Tristan Miranda spent the waning days of summer last year on a California beach doing hip pivots on a surfboard — an extraordinary feat for someone who underwent hip surgery just three months earlier. He had limped into the Hip Preservation Clinic at Vanderbilt Bone & Joint at age 18, then had surgery at the end of his freshman year to correct a hip impingement. The hip impingement was a residual complication from Legg-Calve-Perthes disease, which Miranda had been diagnosed with as a child. But hip impingements — along with hip dysplasia and tears of the labrum — are conditions that often go undiagnosed, setting the stage for debilitating arthritis and hip replacements for people in their 30s and 40s. The Hip Preservation Clinic offers patients a unique care model so they can avoid or delay a total hip replacement. The clinic partners pediatric and adult reconstructive surgeons in real-time collaborations. 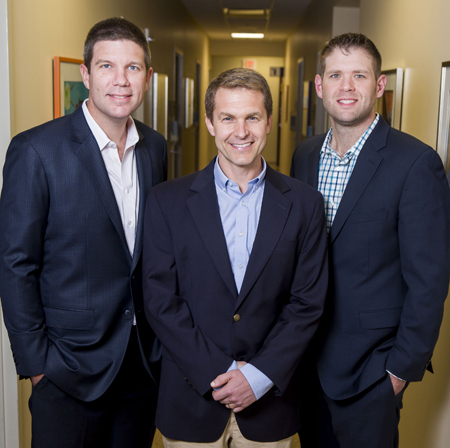 Jonathan Schoenecker, MD, PhD, Gregory Polkowski, MD, and Stephen Engstrom, MD, evaluate complex-hip pathologies at the clinic. Partnering pediatric (Schoenecker) and adult (Polkowski, Engstrom) hip surgeons in a clinic focused on preservation procedures is a new paradigm in orthopaedics. With two providers evaluating a patient in one visit, the surgeons can obtain a more complete history, perform a comprehensive physical exam and jointly review all imaging in order to provide a cohesive explanation of the patient’s diagnosis, as well as offer a unified plan of care. “Most hip preservationists are focused on performing a specific subset of surgeries. We have taken the concept of a comprehensive clinic, in that we have regular sessions together, where we see complex patients and look at them from similar, but unique perspectives, and then come up with a plan as opposed to having a patient bounce back and forth from doctor to doctor,” said Polkowski, assistant professor of Orthopaedic Surgery and Rehabilitation. Many patients who come to the clinic have already been evaluated by a myriad of specialists and have often received conflicting diagnoses, opinions and care plans. “Our main objective is to offer patients an option to save their native hip joint if at all possible,” said Schoenecker, associate professor of Orthopaedic Surgery and Rehabilitation and Jeffrey W. Mast Professor of Orthopaedic Trauma and Hip Surgery. There are a number of reasons to first consider hip preservation surgery. The clinic specializes in state-of-the-art surgical procedures such as hip arthroscopy, surgical dislocation of the hip, rotational osteotomies and the Bernese Periacetabular Osteotomy (PAO) to repair damaged joints and reconstruct congenital deformities in order to preserve the hip. A primary mission of the clinic is patient and family education. The surgeons also use a timeline for making recommendations.